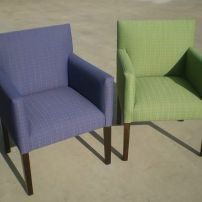 commented on "JARO's Top Selling Delta Modern Sturdy Dining Chairs - Custom Sizing available." JARO's Top Selling Delta Modern Sturdy Dining Chairs - Custom Sizing available. The Delta can be made with or without arms. The Delta comes in a large range of fabric, vinyl, leather and aged care coverings. Other legs stains available. 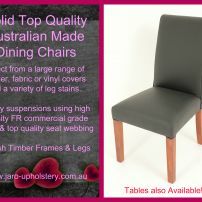 Email enquiries@jaro-upholstery.com.au for further information and prices. commented on "The Perfect Strong Sturdy Dining Chair"
What makes your perfect dining chair? A scroll back or a straight back? A sturdy great seat suspension along with a solid timber frame with a proper sized seat. Top quality foams and a large choice of fabric, leather or vinyl. Decorative features! 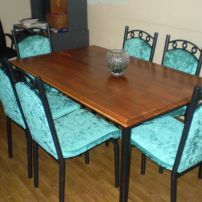 commented on "Custom Made Dining Chairs or Reupholstery Service by JARO servicing Melbourne & Gippsland areas." 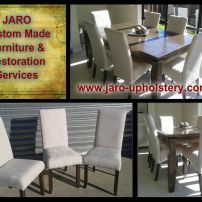 Custom Made Dining Chairs or Reupholstery Service by JARO servicing Melbourne & Gippsland areas. 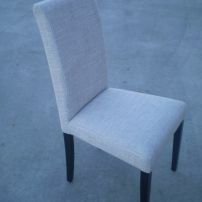 JARO can custom make brand new chairs or recover your existing chairs or seat plates. 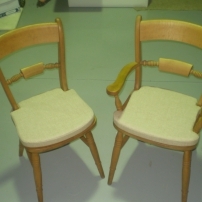 commented on "Melbourne & Pakenham - Dining Chair Seats - new or reupholstery. Great Fabrics & Great Prices!" 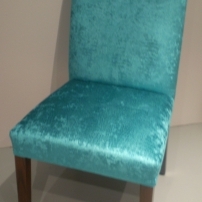 Melbourne & Pakenham - Dining Chair Seats - new or reupholstery. Great Fabrics & Great Prices! 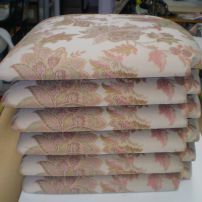 JARO Upholstery can manufacture brand new dining seat plates or reupholster your existing ones. commented on "Dining Chair Reupholstery"
commented on "Cast Iron Dining Chairs Recovered in Zepel's Velvino fabric"
commented on "New Seat Cushions for Dining Chairs"
commented on "Dining Chairs - Give them a new life!" 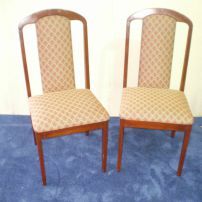 Dining Chairs - Give them a new life! 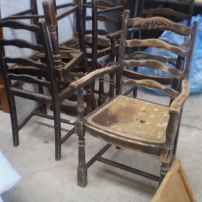 These lovely old dining chair frames will be revarnished and recovered to be used again!